In some ancient cultures Mermaids were regarded as semi-divine aspects of the Goddess, connected to the sea from which life arises and honoured in seaside temples. 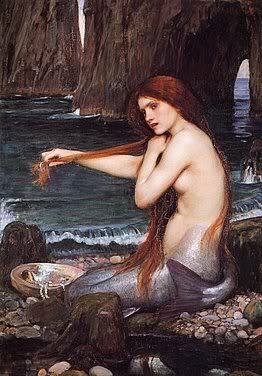 The earliest Mermaid story comes from Assyria around 1000 BCE. Atargatis, an Assyrian priestess, jumped into the sea to wash away the shame of an unwanted pregnancy and emerged as a fishtailed goddess. In the 2nd century BCE, the Greek historian Lucian reported that the statue of the Great Goddess at the temple of Hieropolis (which is now modern Turkey) had a fishtail instead of legs. In Greece, Aphrodite, the goddess of love, as born from the sea foam and rode to land on a half-scallop shell. Mermaids figured prominetly in sailors' lore, because of such travellers' tales. The most common story was that Mermaids were incredibly skilled at seducing lonely sailors and dragging them down to their underwater kingdom. It was also believed that they could cause storms and shipwrecks. These beliefs were reinforced by the medieval Church, to which Mermaids were an emblem of vanity, lust and the spiritual perils of women and of sexuality.